Complete with Transporter2 and Koos iSize infant car seat. 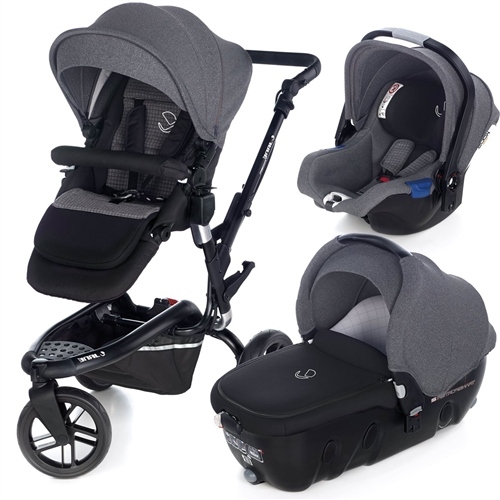 This travel system package comes with the multi-award winning Group 0+ Koos infant car seat and the Transporter 2 Auto carrycot. The Lie-flat Transporter position supports natural, stress-free sleep. Newborn babies should ideally lie completely flat especially on longer journeys. As recommended by health officials, this position facilitates newborn respiration, nurtures the abdomen and aids optimal spinal development. Not only is the Transporters innovative design the response to all new parents who demand better adaptation of design to babies delicate anatomy and their lifestyle, it is also endorsed by recent medical reports. The Transporter recognises this important requirement and gives your child the best start in life.